Hawaii Volcanoes National Park is located on the Big Island of Hawaii. 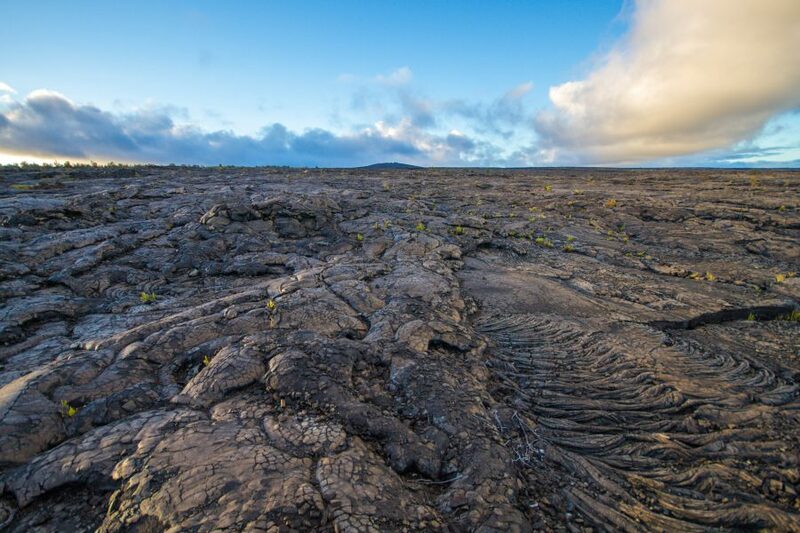 If you want to see an active volcano crater, walk on solidified lava, explore inside a lava tube and witness land being created all in one day, this is the place to be! 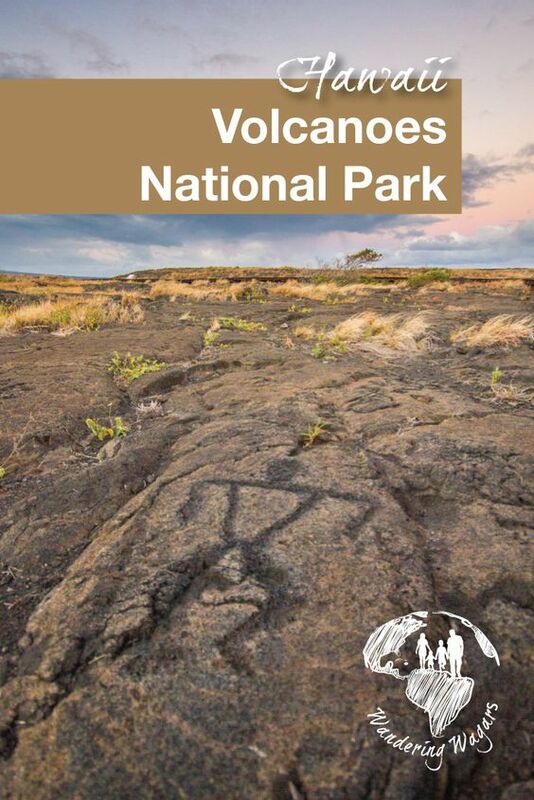 The national park includes the summits and rift zones of two very active volcanoes: Mauna Loa and Kilauea. These are 2 of the 5 volcanoes that created the Big Island 500 million years ago. 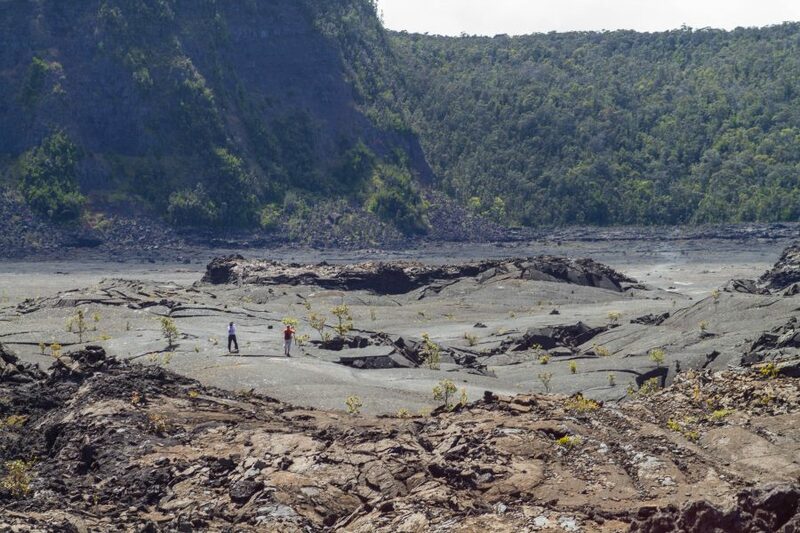 The youngest of the 5 volcanoes, Kilauea, last had an eruption in 2008 at the Halema’uma’u crater. Today, it’s still possible to see lava remnants of the eruption, although, lava is no longer flowing to the ocean. At 300,000 plus acres, Hawaii Volcanoes National Park is vast with tundra varying from seacoast to lowland to rain forest and alpine. Besides the beautiful spring flowers, several types of wildlife can be spotted in the park including the nene (Hawaiian Goose), ope’ape’a (Hawaiian hoary bat), happy-face spiders, carnivorous caterpillars and more. The first stop of any visit to the park should be the Kilauea Visitor’s Center. There you can obtain information about the current lava flows including maps and if there are any trail or road closures for the day. They will also let you know of any ranger guided hikes / tours. The park is open 24 hours a day. For current entrance fees, visit the National Park website. The park can easily be explored on your own via driving on the Crater Rim Drive and the Chain of Craters Road. However, to best experience the park, you should get out of your car and hike some of the 150 miles of trails in Hawaii Volcanoes National Park. It is also best to stick around after sunset to get a better view of the lava flows and the crater glow. Pro-Tip: Road and area closures can change suddenly due to wind and flow strength/direction. Make sure you are aware before venturing on your own to avoid being caught in a dangerous place. 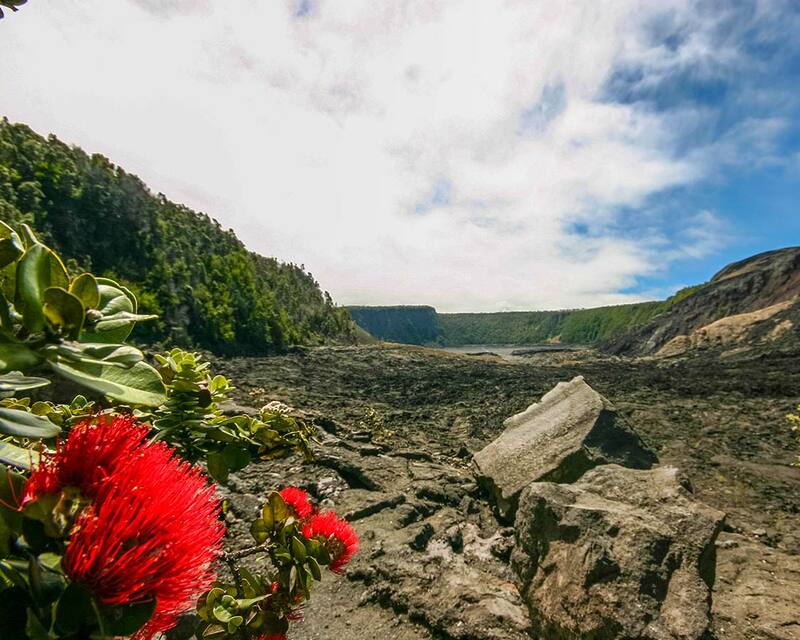 If you only have a few hours to visit Hawaii Volcanoes National Park, this is the one thing you must do. The 11-mile route passes through several scenic spots and you can get out and do some hikes. It will also bring you to the active summit caldera. When we visited the road around the Southwest rift zone was not accessible due to toxic amounts of sulfur dioxide gas. For those that are more adventurous and have more time, it is possible to do the drive as a hike on Crater Rim Trail. Pro-Tip: Although we opted for a 4-wheel drive vehicle, Hawaii Volcanoes National Park can be easily explored using a 2 wheel drive vehicle. The best way to view the eruptions is from the observation deck of the Thomas A. Jagger Museum which is located in the Kilauea Caldera (Caldera: a large crater formed by a collapse). The Halema’uma’u crater is a pit crater located within the much larger Kilauea Caldera, which is 2 miles wide and more than 3 miles long. 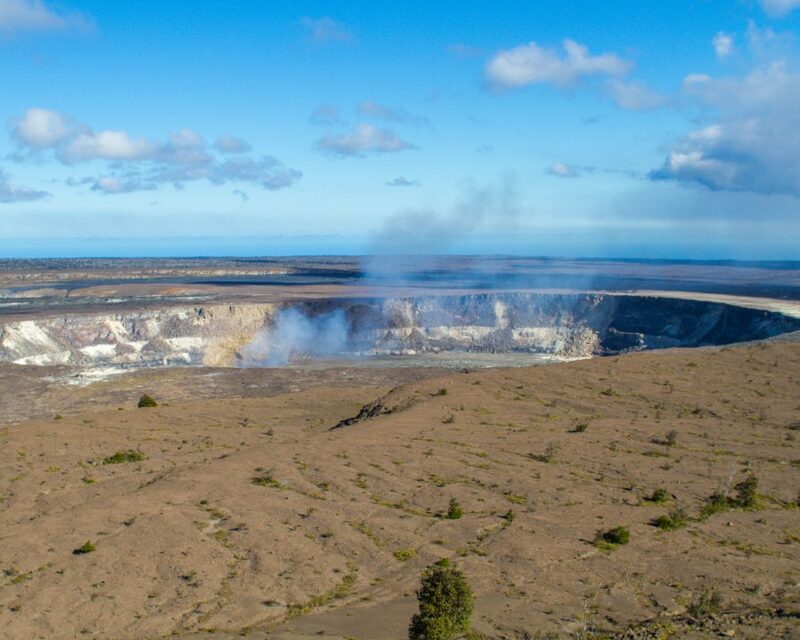 By comparison, Halema’uma’u crater is about 280 feet deep and 3,000 feet across. 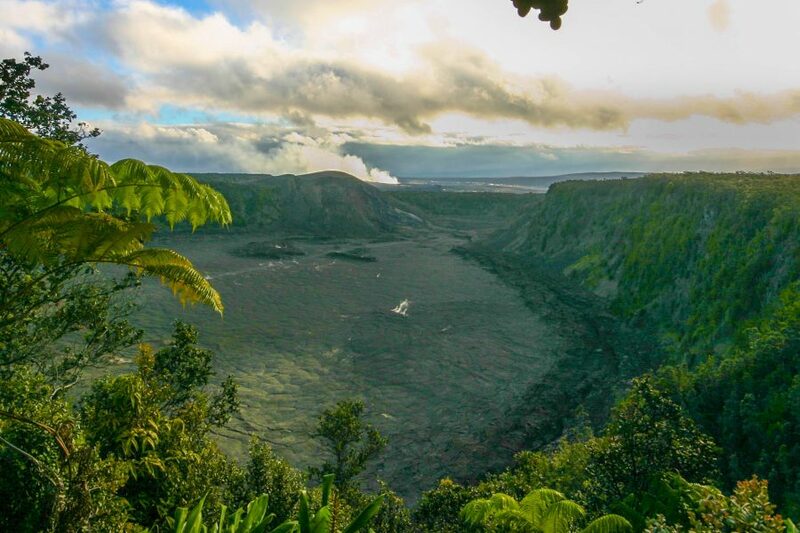 Halema’uma’u crater is also the home of Pele, the Hawaiian Goddess of Fire, making it a sacred place to Hawaiians. 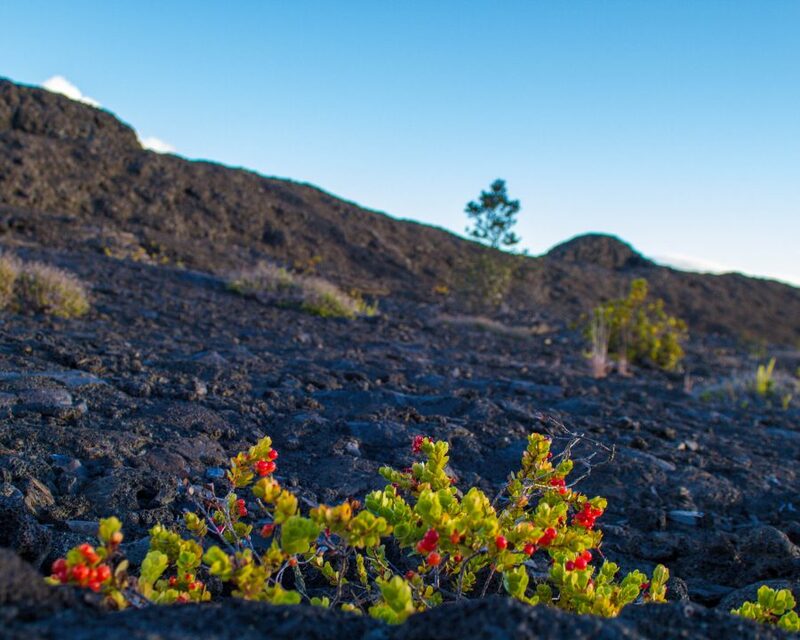 It is not unusual to see offerings to Pele, such as sacred Hawaiian plants, left on the rim of the crater. From the Jagger Musem, the first trail we stopped at is the Sulphur Banks Trail also known as Ha’akalamnu. This is an easy trail that is paved in the first portion then is followed by a boardwalk. At less than 0.4 miles one-way, it’s a very accessible way to witness volcanic gasses seeping from the ground. You’ll also be able to see sulfur crystals and other minerals on the rocks during your walk. Moderate amounts of sulfur dioxide and high amounts of hydrogen sulfide are released at Sulphur Banks so we were surprised to learn that previously this area was used as a health spa and sauna. Other minerals, including gypsum, opal, and earthy hematite, formed by the weathering of the rock and the precipitation of gasses can also be found. In photos of Sulphur Banks, gypsum and opal occur as white coatings on the rocks while hematite appears as a rust-like color. Pro-Tip: The toxic fumes can adversely affect people with heart or respiratory problems. Pregnant women and young children are advised to avoid this trail. Our next hike at Hawaii Volcanoes National Park could be viewed from the Kilauea Iki crater overlook. We would be walking on the crater floor! The Kilauea Iki crater was formed 350-500 years ago when the Kilauea summit collapsed to produce the Kilauea Iki crater. The hike started by passing through rainforest before we descended 400 feet to the solidified lava lake floor. The descent was rocky and the ground slippery. It was mid-afternoon and as we hiked the 2.5-mile trail marked on the lava floor with ahu (stacked rocks used as trail markers), we could feel the heat emanating from the black lava. The intense heat caused us to move sluggishly and it took us over 2 hours to complete the trail. At certain parts of the floor, we could still see steam from the 1959 eruption. Pro-Tip: Bring lots of water and snacks to keep your energy levels up as the hike can be challenging at parts. There is no shade while hiking the crater floor so you definitely need to use sunscreen and a hat. Our third hike in Hawaii Volcanoes National Park involved going inside a lava tube! Lava tubes are formed when an eruption has stopped and lava drains from the tube through which they flow underground. Access to the lava tube is through one of the small pit craters formed at the same time as the Kilauea summit collapse. The trail head is located close to the Kilauea Iki overlook. You must walk through the rainforest section of the park, which is considered a special ecological zone within the park, to reach the entrance of the lava tube. The trail to the tube entrance is an easy 20-minute walk but can be slippery when wet. 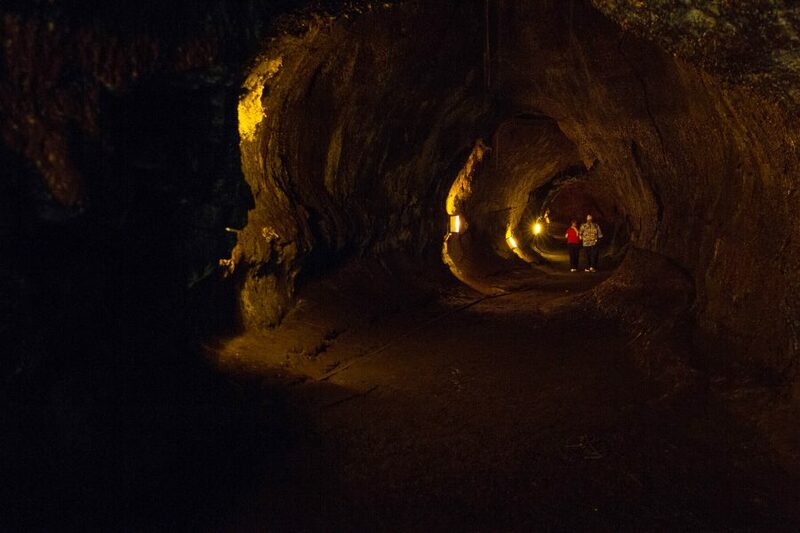 The lava tube is called the Thurston lava tube after Lorrin Thurston, a newspaper publisher that played a prominent role in creating the park. It is also known as Nahuku, which in Hawaiian, refers to the small protuberances that can be found the walls of the lava tube. The trail within the tube is 400 feet long and prior permission is needed to explore further. It descends along the wall of the crater then across its floor. The trail is well-lit but having our own headlamps allowed us to see additional details. The Chain of Craters Road in Hawaii Volcanoes National Park can be reached from Crater Rim Drive. The road allows you to experience amazing views of the East Rift Zone. It is 18 miles long and descends 3,700 feet. At the end of the Chain of Craters Road, it is possible to do one last hike with some amazing views, such as the beautiful Holei Sea Arch. Before reaching the end of the road, we stopped to explore the 0.7-mile long (one-way) Pu’u Loa Petroglyph trail. The site is sacred to Hawaiians and Pu’u Loa means “hill of long life”. Approximately 23,000 images depicting the life and culture of native Hawaiians can be viewed from the trail. Please respect the site and stay on the boardwalk. There are many other areas of Hawaii Volcanoes National Park that we did not explore. If you have more than 24 hours, you can definitely do more day hikes and even explore the backcountry. It is also possible to tour the park by helicopter! 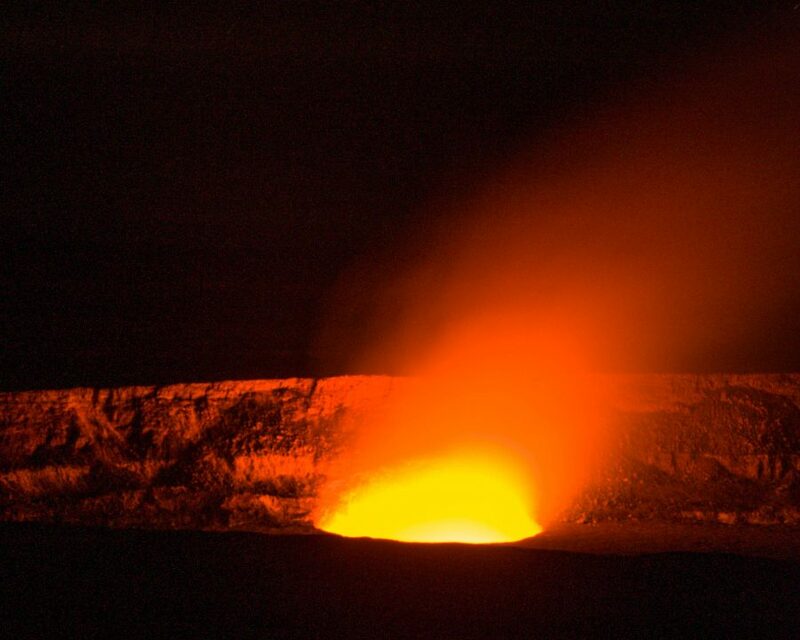 Have you visited or thought of visiting Volcanoes National Park on the Big Island of Hawaii? What are your can’t miss places? This looks amazing!! I love volcanoes:) Saved this for when I make it to Hawaii. What an insane adventure. I love it!! I never went to the park when I was in Hawaii – so totally need to go back! I love the lava tubes – went in some when in the Galápagos Islands! We never made it to the Big Island when we went to Hawaii. Looks like we totally missed out! I’ve never seen anything like that before. Just went to Hawaii but wasn’t about to go here..definitely need to come back! Great pics and tips. I’ve wanted to visit the Big Island for years. I’m saving this for reference as I hope it happens soon. I always wonder about volcanoes and feels an urge to visit one day. If ever I’ll be lucky enough to visit Hawaii, I will definitely explore all the places that you mentioned in your blog. Thanks for all the tips. We always wanted to see a volcano or visit Hawaii. This post has both. Such an out-of-this world place, especially the cave tunnels! And you explain it with such vividry like we are almost there. Wow! I see what you mean by staying at the park after sunset to see the lava flows. Oh wow, that must have been quite a place to grow up! A shame about the town, but such is the nature of … well … nature! WHOA. This looks SO SO cool! These photos are spectacular. I’ve only been to Maui but I think I’ll have to opt for the Big Island next time just to see this! This is one of the reasons why I want to visit Big Island. I love how diverse Hawaii is. I actually loved Kauai when I went there last year. Hope to be back soon! Your pictures are amazing! This place looks unreal, and seems like a real adventure! This is a great post, I was in a volcano once when I was younger and I still remember the smells, sounds and sites. Really informative guide. Bookmarking this one for when we make it to Hawaii! That must have been so cool! and delicious! There is so much natural beauty in Hawaii, especially on the Big Island. Hawaii is incredibly rugged and raw in many places. And the views from Mauna Kea are incredible! Wow — this is too cool! I still have yet to make it to Hawaii, but hopefully someday. I’d love to see an active volcano! If I ever make it to Hawaii, this is definitely on my list. I’d love to go and see the volcano at night! Hawaii looks utterly gorgeous. What an incredible variety of terrain! Definitely need to save up for a trip there and visit the volcanoes, natural parks and trails. Looks like paradise to me! I find Volcanoes one of the most fascinating natural phenomenon and loved this article, the photos are really stunning. Would love to visit here at the earliest. Hawaii is incredible and this guide is something else! I certainly want to do more island exploring once I return to that side of the world. These photographs are beautiful and made me feel like I am there with you! Thanks for sharing and giving me a bit of wanderlust for the Hawaiian islands! It looks amazing! Just yesterday I was talking with someone about the pros and cons of Hawaii. Definitely, these volcanos are some of the pros! I’ve only seen volcanoes in Italy so far, but sooner or later we will reach Hawaii! Nice post! 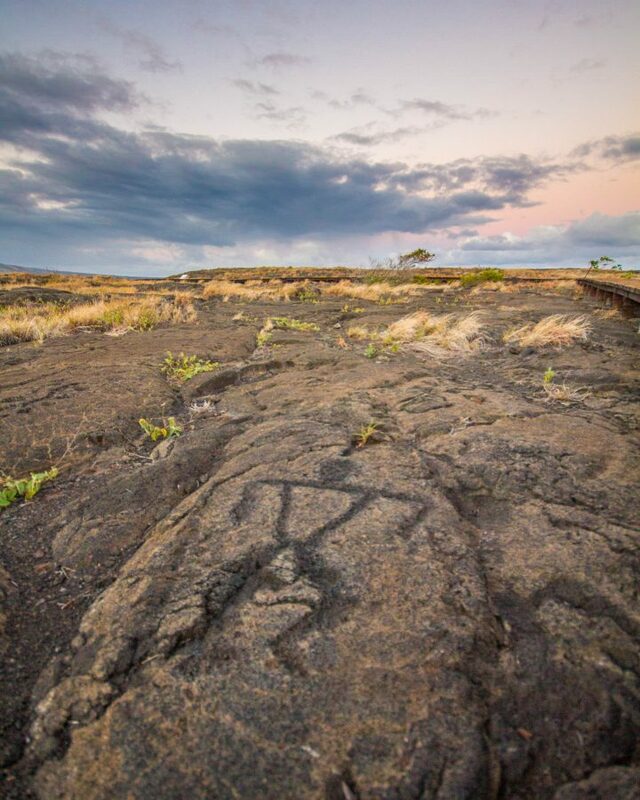 I think I’d want to go on the Pu’u Loa Petroglyph Trail the most because of the images. It’s good that you put that note about staying at the boardwalk. Tourists sometimes get excited about their surroundings and forget about treating nature right so it’s always good to have extra reminders wherever we can get them. Stunning!!! I loved to go here when I visit Hawaii ? looks like an experience of a lifetime! This is absolutely beautiful, so interesting, and unlike anything I’ve ever seen. I lived on Oahu for a while, but I was so poor and still in college that I wasn’t able to travel to the other islands. I can’t wait to go back someday! Wow, I have not heard of this but it looks incredible. The US has fantastic national parks, unfortunately we don’t have anything like this in a city state like Singapore. Have to visit this someday! Gorgeous photos!! I haven’t been to Hawaii yet, but I’ve heard so many good things about their National Parks. Hopefully I’m able to score a cheap flight and visit soon! This seriously came at the perfect time for me! I’m about to go to the Big Island in a month and a week! I had a lot of things on the to-do list, but this was great to see so many of the hikes at Hawaii Volcanoes. The lava tubes with be a MUST for me! Do the tubes get incredibly narrow on the hike? My fiancé is a bit leery of small spaces – haha. I am so excited for these explorations – even more than before! Thanks for sharing! Most of the tubes are fairly large and easy to wander through. I’m 6’2 and I rarely even had to duck. Kazumura cave is also a great option. It’s on private property, so you need to book with the land-owners first, but it’s wide and tall, but you still get to scramble over rocks and explore some cool drop offs. Hawaii is so high up on my list. I would love to go exploring such a beautiful place. Amazing photos!! Makes me want to pack and go visit Hawaii. Thanks for sharing this! This looks magical! Heading to Hawaii in August and will definitely take a look. Thanks! Your tip on the toxic fumes was particularly important for those of us that asthmatics in the family. We always have to take that into serious consideration. Thanks! Well I learned something new today! I had no idea lava tubes existed and exploring one is now on my bucket list. Well researched and great info, saving for a future trip to Hawaii! This baby is HIGH on my list of must dos and I’m glad to see you got so much in in 24 hours. I didn’t know the park was open 24 hours a day and would love to see it at night. I love how you can see so much nature literally bubbling at your feet! Hawaii is one of the only places I’d really like to visit in America, and now I really really want to go. I love the look of those sulphur trails and it would be so cool to see the lava glow! Really well done post. Thanks so much! One thing that is so cool about the sulphur trail is the incredible colours that the gases have caused on the landscape and the iridescent rocks from the superheated gases on the rocks. Wow! What adventurous hikes!! And such a unique atmosphere. I’ve been to Hawaii, but never hiked a volcano before. I feel like this would be a bucket list experience!! I love how you also provided tips along the way – what a great guide! I agree, when I went to a place like this it didn’t feel half as fun when we didn’t trek on foot. I am captivated by that lava tube, I’ve always wanted to feel like I’m in a place where those molten hot magma would possibly go in and out. Great place! You snapped a lot of good pics as well! Thanks! It’s a really cool experience! Never heard of those tubes before. That looks amazing. I was wondering though, what’s the process for getting prior permission? Is it something you work out with the National Park or is really elaborate? I love this place. Fantastic hikes. You’ve done a super good write up on it and your photos are great! This is so helpful, I’ve always wanted to go to Hawaii! Volcanoes National Park is pretty much the only reason I’d want to go to Hawaii. It seems so otherworldly and quite fascinating. Awesome photos! Stunning! Hawaii has a lot of these natural wonders! Can’t wait to go there if time permits and check your blog again for these places. We skipped Volcanoes National Park when we were in Oahu earlier this year. while i really wanted to hop over to the big island and explore, with just me and two little ones, i didn’t think they (or me) were quite ready! i would love to explore it via helicopter once they get a bit older! It’s a pretty amazing place for kids to explore as well. We are looking forward to returning with our little ones someday. A Helicopter ride would be a great way to see it! What?! This place is unreal. Amazing…volcanoes are so incredible. It looks absolutely stunning! Your photos are awesome. Hawaii has long been on my list…and it keeps moving closer to the top when I read posts like these! We loved exploring volcanoes when we travelled in New Zealand! This looks like an amzing palce to explore, going down a lava tube, wow! I’ve been to Hawaii several times but missed out on the Big island 🙁 I had no idea that volcanoes national park was more than the lava spewing into the ocean! Hawaii will never cease to fascinate me!!! A volcano in Hawaii? Now this is new to me! I’ve never been to the US and I I always stumble upon new and amazing places to explore in the US! Best and stunning pictures hvnp.